I love how floor looms work. 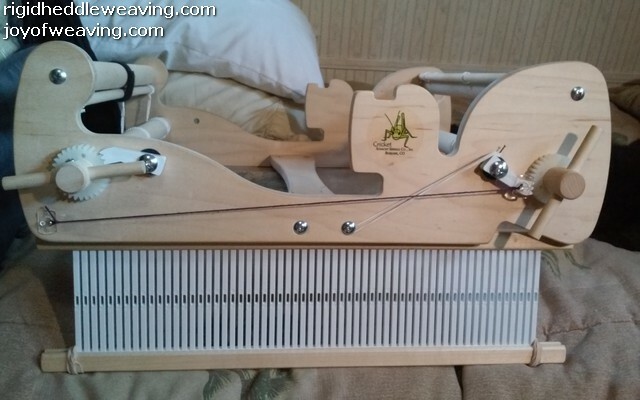 I love my little Cricket Loom, but it doesn't work like a floor loom does. 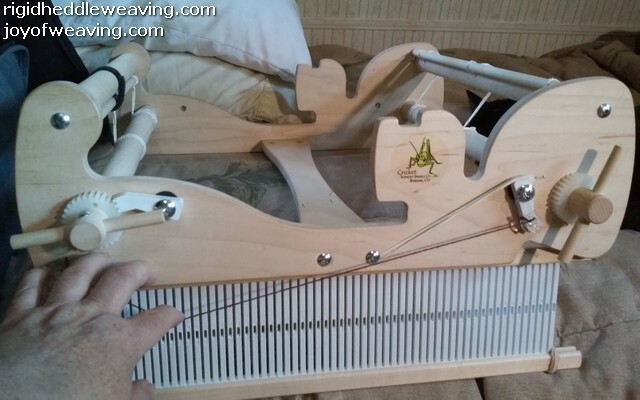 I decided to do something about it with a little loom hacking. This is what I came up with. It's not pretty, but it works. First, I flipped the pawl around so the beam spun counter clockwise for beaming the warp. 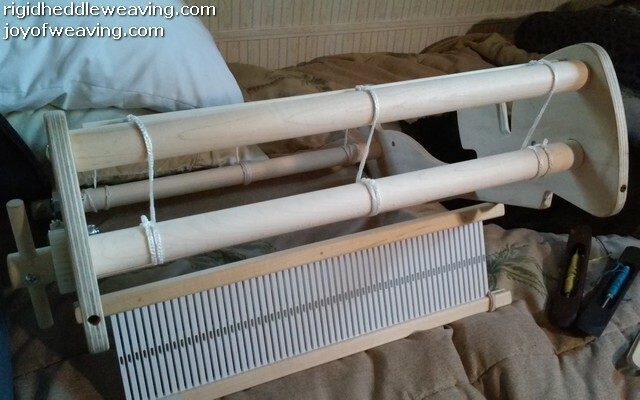 This makes it easier to pack in warp separator since you access it from the back (not underneath the loom). Next, I heated up a push pin and pulled out the pin part. It was like a tiny nail. I heated it up again and stuck it into the end of the pawl. I attached a rubber band between the "nail" and the screw at the bottom. This keeps the brake engaged. When I have a chance to get to a hardware store, I'll replace this and put a couple of tiny screw hooks and a small spring to do the same thing. 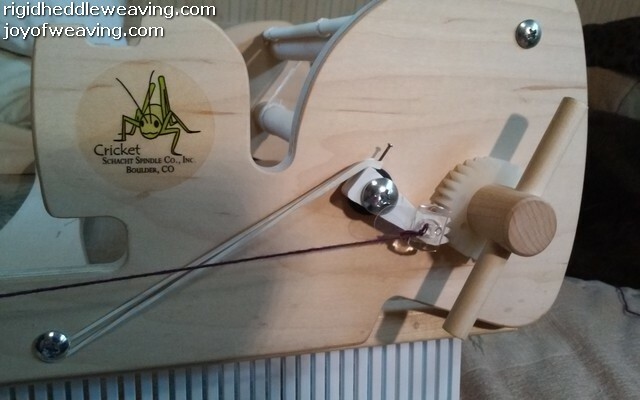 Next I attached a very small Command Hook to the pawl and another one at the front of the loom. I took a piece of 8/4 cotton carpet warp and made a tight (but not too tight) line between the hooks. This is the brake release. Pulling down on the string will disengage the brake. It will now be a much easier to advance the warp. To get the brake to disengage, release all the tension on the cloth beam and then push down on the string attached to the pawl. This system would work better if the pawl had only 1 tooth instead of 3, but releasing all the tension on the cloth beam and letting the web go slack makes a lot of difference. The method is the same for preventing spin-back on floor looms. 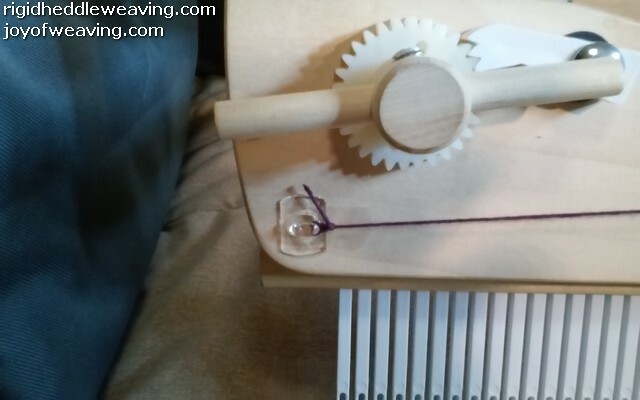 By releasing the tension on the warp from the cloth end, there's nothing to go "snap" when you release the brake on the warp beam. Wow! You are amazing to “see” this! Thanks for your kind words! I might reverse the cloth beam too. That lessens the chance of the right side of the web becoming soiled since the majority of it will will roll up with the back side facing out. Come here from a bad link? Looking for something in particular? Here's a nice search box for you.